New to the charter market, Loon is a stylish yacht with a timeless, elegant and light filled interior by Glade Johnson. 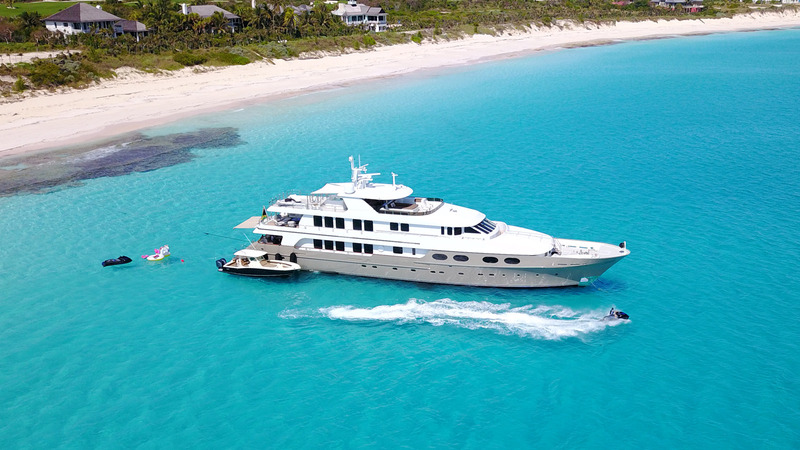 She sleeps 12 guests in six staterooms and carries a crew of nine to ensure a relaxed, luxury experience. She was extensively refitted in 2017 and 2018 and is in excellent condition. Loon stands out for her beautifully finished interior in light cherry wood with lacquers and exquisite attention to detail. She has an abundance of large windows on each level, allowing for plenty of natural light. Perfect for lovers of the outdoors, in addition to her main and bridge aft decks she has more exterior spaces including the impressive sun deck, which has every possible ingredient for the perfect charter; a four-person oversized sun bed, Jacuzzi, barbecue and lounge seating make this space the perfect retreat for relaxing in the sun or enjoying informal outdoor dining and drinks. Dive directly from the yacht! Towables, inflatables, wakeboard, water skis. The full beam master stateroom is located forward on the main deck furnished with the king bed and finished in light cherry wood. The remodeled master bathroom boasts a Jacuzzi tub and a separate shower. The four additional guest accommodations are accessed through the lower deck lobby, with the two forward cabins equipped with king beds both convertible to twin beds if needed. The lower aft starboard stateroom is also convertible to a king or twin beds to accommodate a wide array of guests. All guest suites have excellent wardrobe space, en suite bathrooms finished in Calacatta marble, and individual audio/visual centers. A central passageway from the guest stateroom area gives crew access from the laundry area to the guest area for discreet housekeeping duties. Located in the main deck amidship to port, aft of the Master suite and ahead of the galley, this cabin is ideal for a nanny, staff or children. It has recently been fitted with a queen bed, accommodating two guests and can be accessed from the main deck foyer. The main deck dining room is located aft of the foyer, with a large wood block table comfortably seating 12 guests. 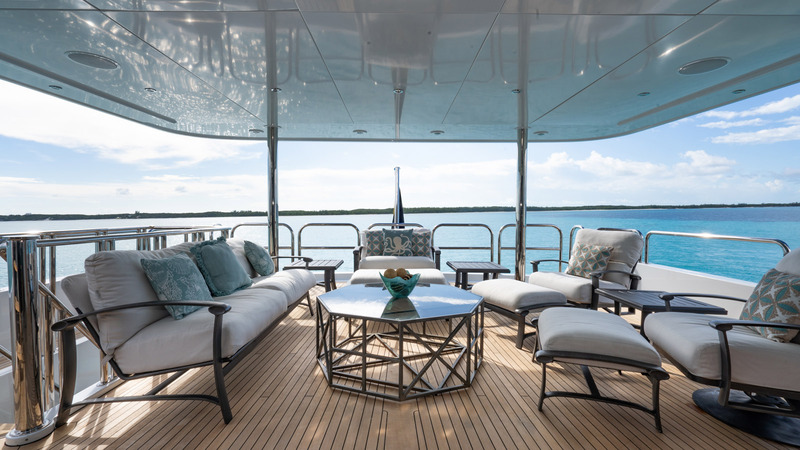 The main deck salon is an elegant, intimate space with a large pop-up TV, three oversized chairs and a pair of armchairs arranged around a coffee table, with direct access to the spacious aft deck. 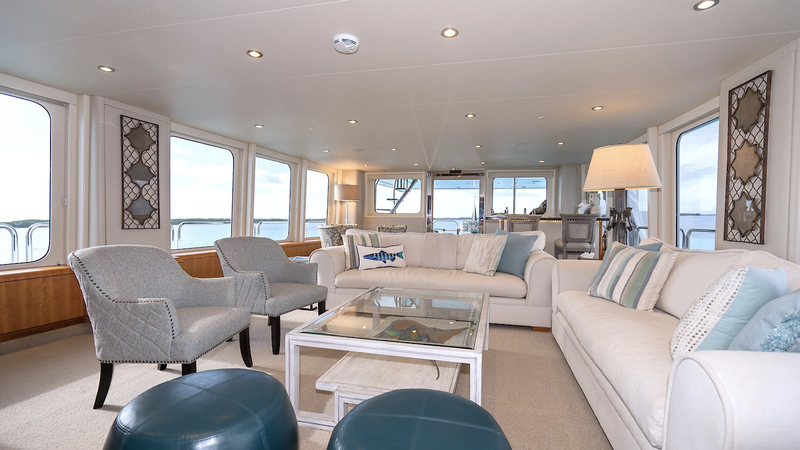 A lovely open aft deck offers alfresco dining for 12 with built in settee and chairs. There is a wet bar to port and storage to starboard. Stairs set to starboard lead down to a large swim platform. Stairs to starboard lead up to the bridge deck. Passarelle access is to port. The delightful sky lounge is the yacht’s primary relaxation area and guest’s favorite space for entertaining. There is comfortable group seating, a new wet bar and a large screen TV built in the forward cabinet. The outside deck, aft of the sky lounge is arranged with chairs around coffee tables and is entirely shaded from the sun by the sundeck overhead. Exceptionally large, the sun deck has a forward helm station equipped with three navigation chairs. Aft of this is a central four person sun bed, a long settee and a table to port, a gas barbecue grill, refrigerator and sink to starboard and a large jacuzzi. Relax and rejuvenate in the comfort of the upper skylounge. 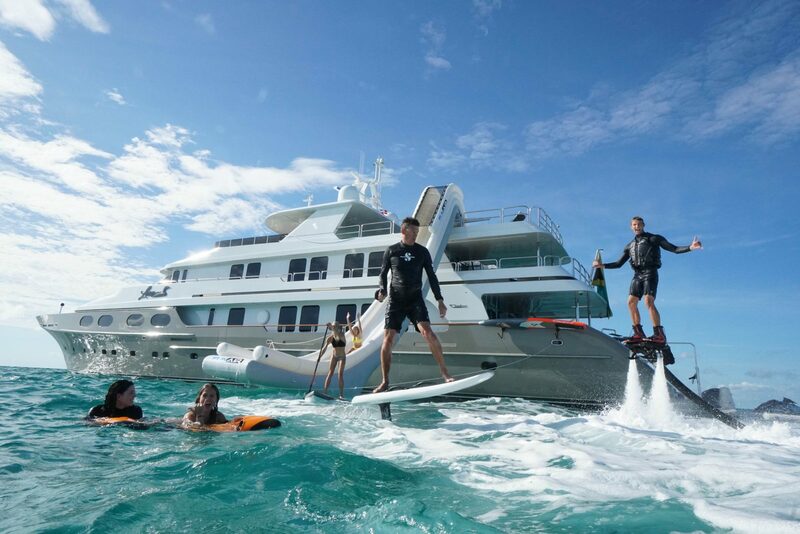 The best selection of water sports on any yacht on the charter market! Aft of the skylounge is an al fresco deck perfect for enjoying a cocktail while soaking up the warm ocean breezes.